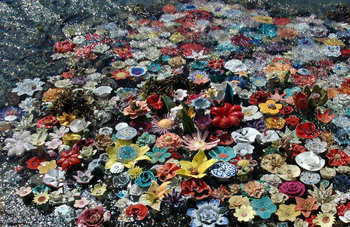 Flora Metamorphicae explores the complex relationship between nature and culture and is an evolving artistic collaboration where masses of ceramic flowers interact with the surrounding environment, from seashores to museum spaces. The group working on this project are six Norwegian ceramists: Kari Aasen, Lippa Dalén, Siri Haaskjold, Bjørg Hougen, Audhild Rypdal, and Eli Veim — all of whom have studied at the Bergen National Academy of the Arts. Flora Metamorphicae began in 2003. Since then, the project has been installed in outdoor spaces, galleries, and museums, across Norway, Sweden, Finland, Lithuania, and the United States. With each new exhibition space, the group discusses and explores new themes relating to the space. Even though the group has a certain idea or framework in mind for each exhibition, the most important part of the process is when the artists meet with the space and begin the installation of the 4,000 objects. For the Nordic Heritage Museum presentation of Flora Metamorphicae, Kari Aasen and Eli Veim will travel to Seattle from Bergen, Norway, to create a unique installation in one of the Museum’s galleries. We will also host additional Flora Metamorphicae events at the museum, please check our calendar.